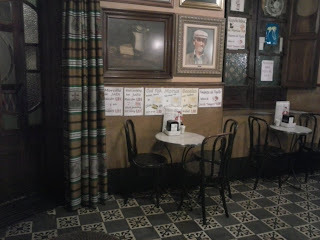 Since it opened, some say in 1886 others 1888, Bar El Gorrion has been in the same family and is the oldest bar in Jaen. Find its original wood and stained glass doors in one of the narrow cobbled streets of the historical Jewish quarter and enter into a time warp. Just a stone throw from the enormous Jaen Cathedral, the bar´s hardly changed since the end of the 19th Century. We were looking for this particular bar but on entering we thought we´d made a mistake, and I have to admit, we looked at each other, hubby, youngest son and I, and almost turned around and walked out again. There was an odd smell and it felt dirty like a dingy smoke-filled movie-style old-man´s bar. My thoughts swung wildly between horribly shoddy to characterful delights like the original floor tiles and thick wooden bar top and beams. It even looks like the same layer of paint and the awful browny ceiling which may be a hundred-plus years of smoke. Initial distaste over we agreed to have a very quick beer and go elsewhere. 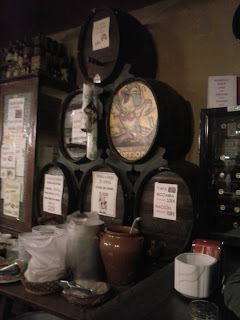 But its charm grew, the lady behind the bar was very friendly, the tapas pretty good and the chalk tally on the bar enticed us to another. 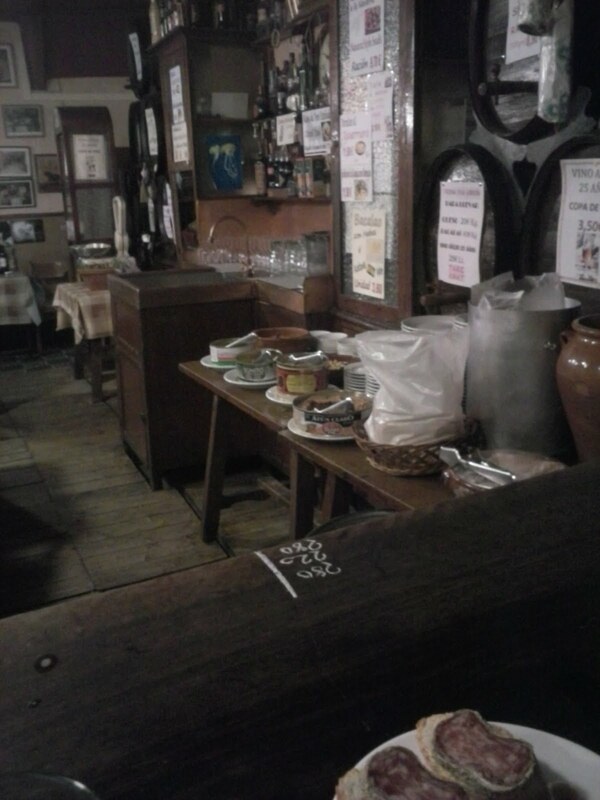 A table behind the bar was laden with plates, tins of fish and tapas bits, no counter-top stainless steel refrigerated units here; we watched our tapas being thrown together. On show in a glass case is a mummified jamon, 94 years old we were told, dehydrated and wrinkled it certainly looked its age. After several failed attempts to find this bar our visit was both satisfying to have finally gained entrance and disappointing, but shock over, there was some pull about it that means now I´ve found it, I will return, preferably with some sunshine pouring in through the stained glass and to sample a ration or two for which rather surprisingly Taberna El Gorrion (meaning The Sparrow) has a good reputation.